George's Hangar: One thru Ten? & Camels? One thru Ten? & Camels? 9) U laugh at this because you feel like an idiot & know everyone else does it too. Those white lines are the camels. So what are the “camels”? Well, where is the sun? Things are not always as they seem – especially from the air. Thanks Cat, I had to look closely to see it also. Amazing how perspectives can change when viewed from high above! Laughed out loud reading 1 - 10, minus the 5. 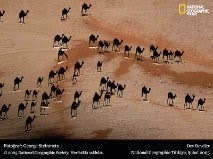 Have to admit, though, I don't get it about the white lines being the camels..... ? Hi Sadie, I am glad you enjoyed it, I feel for it too. Don't feel bad, it took me a few times to see what the camel picture was all about. The white lines are the camels and what appears to be camels are actually shadows as viewed from above with the sun low in the horizon. LoL George, thanks for the giggle. You got me :) The pic is awesome! Thanks Roz, it got me too! I agree the camel picture is awesome. I had a teacher who once gave out a test, reminded us to read through the directions, and then told us to work silently. There were probably 10 tasks listed and one was to count how many kids were wearing a certain color, so it quickly became obvious who had not read the directions, because it said to just put your paper down and watch the rest of your class. I think only 1 or 2 had really read them, but as they giggled with the teacher, the rest of us caught on that something was up, and went back to read the directions. It took some longer to catch on, lol. Hi Cali, Amen to predictable! I had a teacher who gave one of those tests also. Unfortunately, I was one of the kids that didn't read the directions! I wish for you lots of rain and no earthquakes! Willie, you have an imagination that is priceless! I guess I best do another post pronto so you won't take me off of your dashboard! As you know, I too am a bit dyslexic. I always think of the joke about the dyslexic agnostic insomniac who laid awake all night pondering the existence of a dog! Sorry Goerge but you got me completely confused. Which isn't difficult when you are blonde and an Ami!